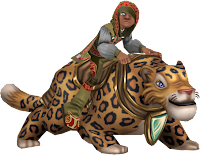 Yesterday, Kingsisle released the newest mount in Wizard101. Introducing, the Jaguar! This mount, compared to the other feline mounts, is only 6,500 crowns for the permanent mount! A 7 day rental of it is only 2,000 crowns! Like most mounts, it has 40% increase speed and it looks pretty epic! I for one am not the biggest mount collector (especially since I play with crowns and I have little to spend) but I suggest you all go out and get it! It is really cool looking and I feel like it is going to be a huge hit especially since it only costs 6,500 crowns. BREAKING NEWS! Pirate101 Launch Date Announced! Yo Ho Ho and a Bottle of Yum! PvP Central & Trivia Tuesday! Purreau's Pet Pack Is Finally Here!